After his religious nutcase grandmother dies, teenage Tony Marino is sent to live with foster parents in Clement, Massachusetts, where he is given the opportunity to attend an exclusive private school. Kalos Academy is sort of like Hogwarts if Hogwarts was A) American B) a private day school C) not overtly magical and D) catered to children whose IQ is off the charts. To attend Kalos, you’ve got to be smart. Really, really smart. Class attendance is encouraged, though not required. There’s no grading system, only a pass/fail option. Although he has a rocky start at first, Tony feels like he’s finally settling in—of course, this is before weird things start happening. In religion class, he touches an ancient scroll the teacher has on display for the students—and it bursts into flames! On a class fieldtrip to Plymouth Rock, the historical stepping stone bleeds and stains Chesapeake Bay a dark red. Later, the town of Clement is set upon by swarms of flies. Since Clement was a relatively normal little town before Tony the New Kid’s arrival, his classmates naturally think he’s cursed. But Tony doesn’t believe in that kind of nonsense. Of course, this being a fantasy story, there has to be a little bit of magic—just not the Hogwarts kind. Actually, it’s more of the Satanic-doomsday-cult kind. And the cult is after Tony. 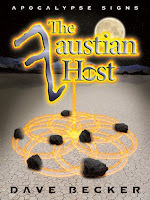 The Faustian Host is definitely an interesting story. Becker’s descriptions of Kalos build a colorful picture of a unique academic institution that will make public school students envious, and his treatment of the well-worn doomsday scenario is convincing. However, it’s not without its flaws. The overall pace of the novel feels somewhat rushed, and the cast of supporting characters is left underdeveloped. Although apologies must be made for mentioning Harry Potter, comparisons become somewhat inevitable as the plot develops. A restless young man plucked from obscurity, Tony is sent to a special school and turns out to be “the Chosen One.” Pursued by a Death-Eater-like cult, he is later entrusted with the safekeeping of an all-powerful ancient artifact. However, despite these technical criticisms, teens eager for new urban fantasy/adventure epics will definitely enjoy what they find here. Recommended for Ages 14-16.